Well it really does seem that 2013 is going to be a big year for babies… what with the hotly anticipated Royal baby due this Summer in the UK, and the queen of reality TV producing a suitable heir to the Kardashian throne over in the US. With all this going on, it seems that the world is going baby crazy!! 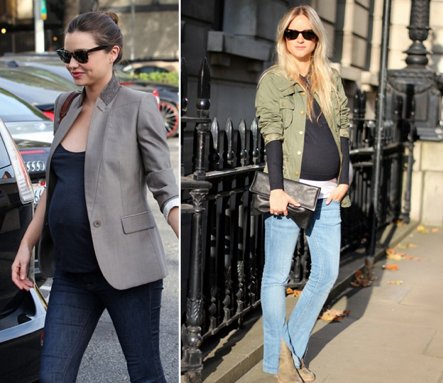 So whilst we all wait with baited breath to see who has the cutest kiddie later this year, we can’t help but spend our time doting on who made the right (or wrong) fashion choices throughout their pregnancy. So lets start with the not so good shall we? Poor old Kim Kardashian – she is getting it in the ear quite a lot about her pregnancy clothing choices. But should we really be giving her such a hard time? Shouldn’t you be proud of your beautiful bump? Of course, so why when wearing such tight gear is she getting such a telling off? Well, maybe squeezing into a leather dress when pregnant is a little over board (and may be a little too restrictive for baby bump), but she looks happy and healthy so we’ll let this one slide. Here you can look stylish and ready to take on the world as you head out teaming a tight top with a fashionable jacket to balance it up, and then some great skinny jeans to remind yourself that yes, you still can fit into them, and yes, you still look fabulous! The queen of mastering a fashionable pregnancy is Nicole Richie. With Summer quickly approaching its going to be all about cute sandals and floaty dresses (the perfect combination to show off your blossoming bump and glowing complexion). You can find inspiration from Nicoles’ A Pea in the Pod collection – a perfect excuse to do some internet shopping! 3) Go all out Glam! Who says you don’t know how to party when pregnant? On a (relatively relaxed) night out, make sure you still turn heads and dismiss anything dumpy by saying hello to sensational pregnancy wear. Take some inspiration from Peaches Geldof (yes, we never thought we’d say this but…) she looks so fabulous in this vintage looking frock which says ‘I’m pregnant, proud and fabulous’ Who says this look is just for celebrities, get creative and get out there! So there you go, three simple ways of looking pregnant and perfect at the same time! So Kimmy K may not be our style guru of 2013, but at least she embraces her bumps and curves as every woman should. But if you are looking for the ultimate style sensation then in our book there really was one lady that managed to capture it all when she was expecting and that was the amazing Angelina Jolie – check out her capturing all of our top three tips for pregnant fashion – what an inspiration! If you have any fun fashion tips for all those pretty pregnant ladies out there, make sure you let us know here and on Twitter @mysnoochiebooch.